Having lived in Malaysia for more than 10 years, it is no wonder why my family loves this dish. In Malaysia, Nasi Lemak is considered a national dish and this is usually consumed in the morning; Nasi Lemak hawkers can be seen anywhere nearby schools or offices. Traditionally, Nasi Lemak is served with a hot spicy sauce (sambal), and usually include various garnishes, including fresh cucumber slices, small fried anchovies (ikan bilis), roasted peanuts, and hard-boiled or fried egg. You will also see some additional dishes which you can add to make a more substantial meal. These dishes are ayam goreng (fried chicken), sambal sotong (cuttlefish in chili), small fried fish, cockles and rendang daging (beef/chicken). 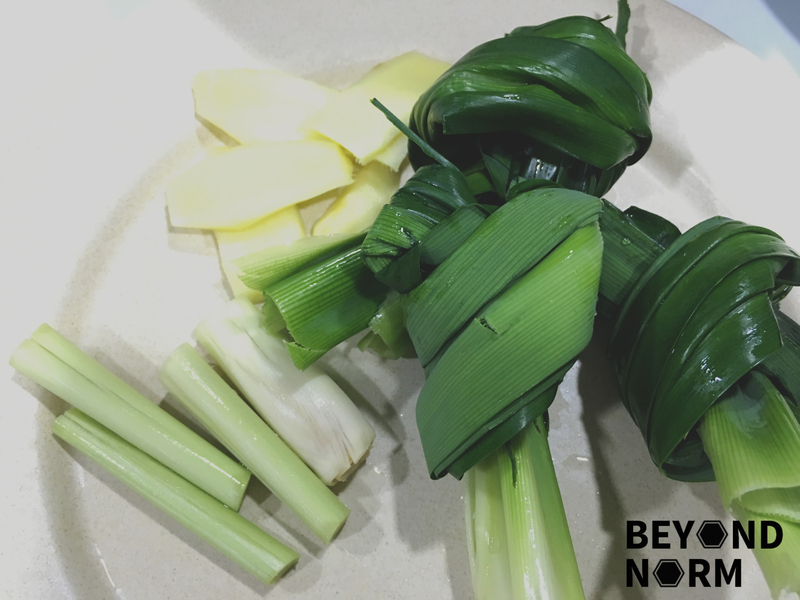 Interestingly, when we returned to Singapore, we saw a different variation of how this nasi lemak is being consumed. Nasi Lemak usually comes with a deep fried chicken wing/drumstick, boiled eggs/fried eggs, fried anchovies, and a sweeter version of sambal. The additional dishes which you can choose from is fish cake, curried vegetables and luncheon meat. I have been trying to perfect this rice for a long, long time. To me the rice needs to be not only fragrant but not soggy. I hope what I am sharing will help those who wants a good Nasi Lemak to begin with before I start sharing the dishes in my following posts. 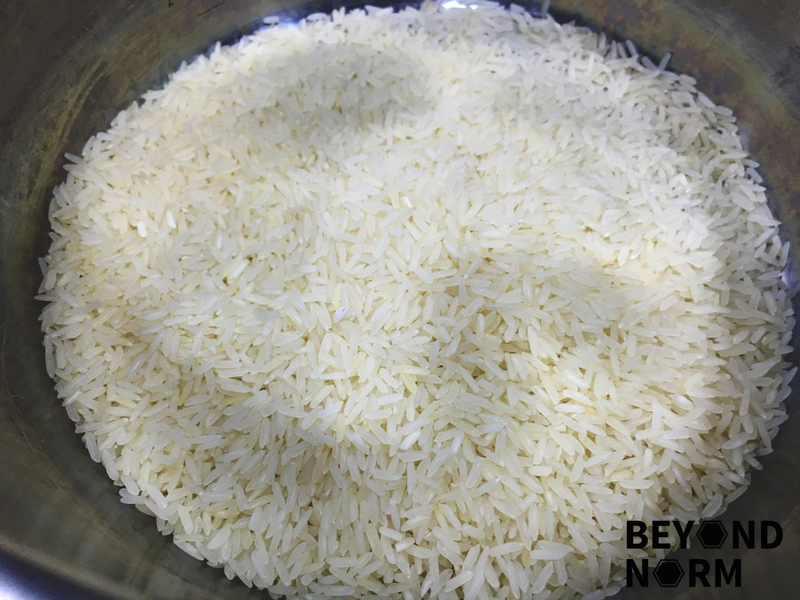 Wash, rinse and drain the rice. 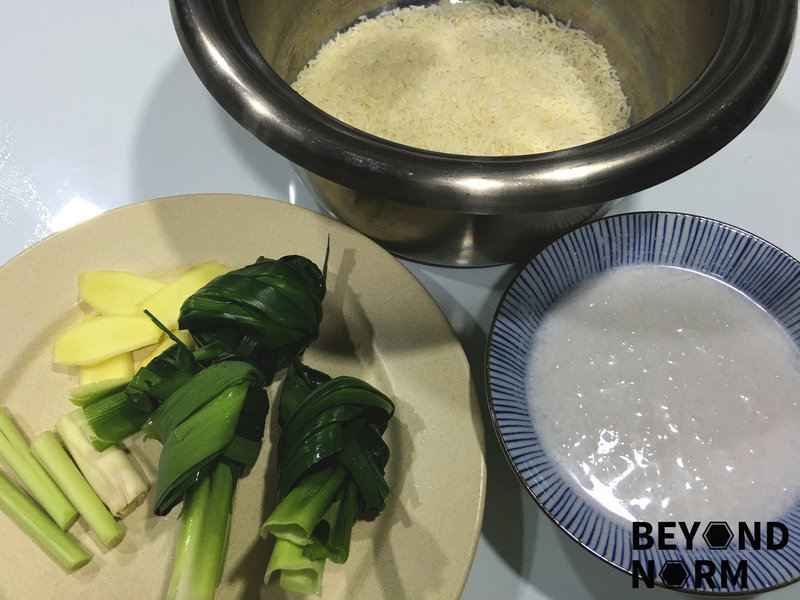 Add coconut milk, sliced ginger, crushed lemongrass and a pinch of salt into the rice and mix well. Lastly add the knotted screwpine leaves (if available). Cook the rice in the rice cooker. 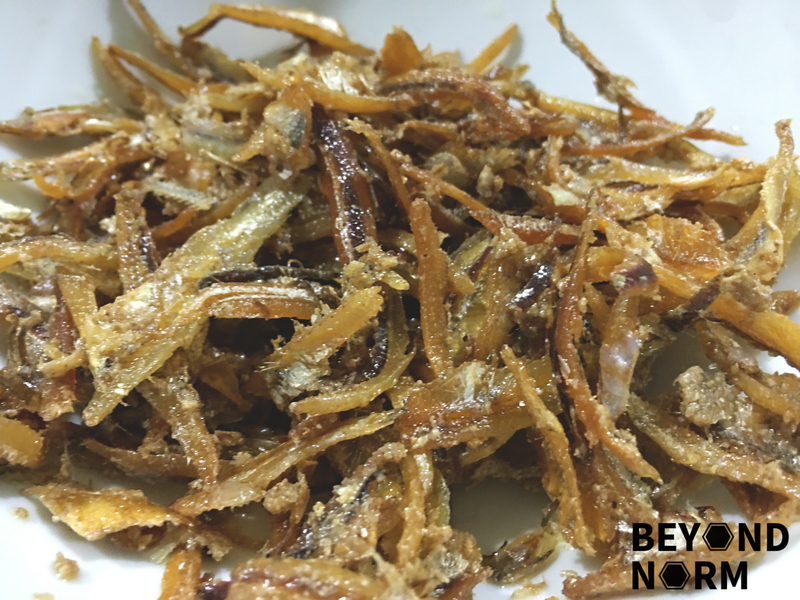 Pound the prawn paste together with onions, shallots, garlic, and deseeded dried chilies with a mortar and pestle. You can also grind them with a food processor. Soak the tamarind pulp in water for 15 minutes. Squeeze the tamarind to extract the flavor into the water. Sieve the pulp and save the tamarind juice. Heat 3 to 4 tablespoons of oil in a pan and fry the grinded spice paste until fragrant. Continue to simmer on low heat until the gravy thickens and then set aside. Wash the dried anchovies and drain the water. Sauté the anchovies until they turn light brown and crispy and set aside. Boiled the eggs for about 3 to 4 minutes. Deshell the hard boiled eggs and then cut them into half and set aside. Heat up a frying pan with a little oil and pour in the beaten eggs. Remove the eggs from the pan when it is nicely fried. Cut them into strips or divide into 3 to 4 portions and set aside. 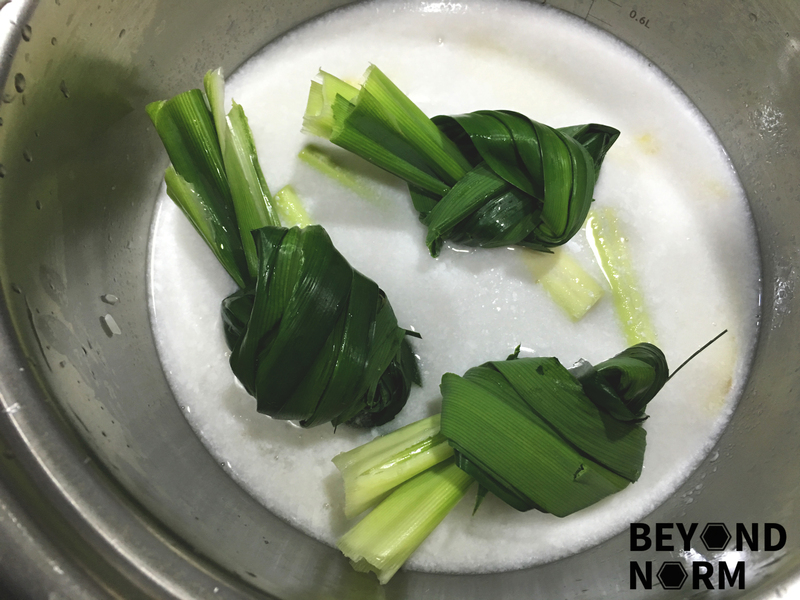 Place a piece of cleaned banana leaf on a plate and spoon the coconut milk rice on it. Garnish the rice with cucumber slices and hard-boiled eggs/fried eggs, fried anchovies, sambal and roasted peanuts. Your recipe on nasi lemak seems good, i will give it a try. Thanks for sharing. Hope to have more equally interesting recipes from you.